Blue Origin's New Shepard suborbital vehicle stands on the launch pad at the company's West Texas test site ahead of a planned July 18, 2018, test flight. Jeff Bezos' spaceflight company Blue Origin will launch its second test mission of 2018 on Wednesday morning (July 18), if all goes according to plan. The New Shepard suborbital vehicle is scheduled to launch from Blue Origin's West Texas test site Wednesday at 10 a.m. EDT (1400 GMT; 0900 local Texas time). You can watch the action live on Space.com, courtesy of Blue Origin or on Blue Origin's website; coverage begins 20 minutes before liftoff. New Shepard is a rocket-capsule combo that Blue Origin is developing to take paying passengers and scientific experiments to suborbital space and back. Both elements are reusable; the rocket comes back to Earth for a vertical landing, and the capsule floats down softly under parachutes. New Shepard has flown eight test missions to date, all of them uncrewed. The most recent came in April, when New Shepard got 351,000 feet (106,984 meters) above the planet's surface — higher than it's ever been before. The April flight was the second featuring "Version 2.0" of the New Shepard crew capsule, which features extra-large windows and other amenities. The debut launch of this variant occurred in December. Both 2.0 flights carried an instrument-laden dummy that Bezos dubbed "Mannequin Skywalker." 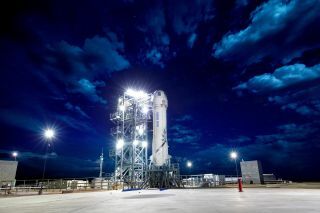 If the test program continues to go well, New Shepard could begin operational flights as early as this year, Blue Origin representatives have said. The company has not publicly revealed how much it will charge for a seat aboard the suborbital vehicle. Blue Origin views suborbital space tourism as a stepping-stone to much bigger things. The company is also developing a heavy-lift rocket called New Glenn, as well as an even more powerful launcher known as New Armstrong. Bezos has said the company's ultimate goal is to help get millions of people living and working in space.